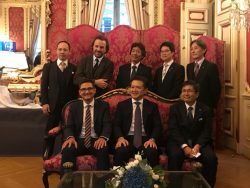 On 11 October, leading Japanese cosmetics company Kosé opened its first European R&D center, in Lyon, with Aderly’s assistance. The company will now have a full-time researcher hosted by Lyon laboratory CTI Biotech, specialized in tissue engineering and stem cells. This center aims namely to develop fundamental dermatology, in order to determine the mechanisms behind skin aging and to assess the usefulness of raw materials through 3D dermatological models. After two Japanese firms specialized in dermocosmetology recently opened facilities in Lyon – Nikko Chemicals in 2016 and Nagase & Co in September 2017 – the arrival of Kosé further strengthens the ecosystem in the greater Lyon area, today a leading player in tissue engineering. Indeed, Lyon offers a one-of-a-kind network of scientific expertise, actively cultivates partnerships with companies, and offers cutting-edge university training programs, creating an environment that can help companies in this industry to thrive. To find out more about the history of tissue engineering in Lyon, download the press release.